Cracks in industrial concrete floors can be the result of shrinkage from the initial concrete installation or from settlement over time. Concrete shrinkage is usually evident within 30 days, but concrete settlement may not appear until after years of continual use. Concare has the best tools and products to properly prepare and repair cracks in the industrial or commercial concrete floor. Concrete cracks can impair operations in warehouse, distribution centers and manufacturing facilities by creating bumps and trip hazards. Industrial cracks in the concrete also collect various types of debris which is time consuming to remove, and can get into the manufacturing process. Virtually every kind of industrial, manufacturing or warehouse facility is likely to have its share of concrete floor cracks. Cracks in the concrete floor can be repaired before the crack widens or grows larger in size, from constant traffic conditions. We use the highest quality materials performed by experienced workers to deliver a quality repair that will last for the long term. 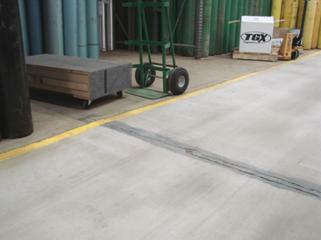 Contact Concare to repair the cracks in your industrial concrete floor.